Nature is a place underappreciated by some, but adored by many. Surrounded by nothing but the ground below you, the sky above, and trees, mountains, and other beautiful, and natural, things around you, the great outdoors can not only be a relaxing and therapeutic thing to surround yourself with, but it can also create fantastic experiences. No one likes to be cooped up in the confinements of their home nonstop, and although some prefer fancy hotels to vacation in – there are those of us that would rather be sitting on the edge of a mountain at sunset. That all being said, camping is not always inexpensive, and traditionally costs well over three hundred dollars for your average 3-day, RV camping trip when you take into account everything you will need – gas to get to and from the campsite, food, water, the actual campsite cost. Depending on how long you plan to stay, camping can be very pricey indeed. If you think about the actual costs, an average campground might charge $15 per night – but that’s without water and hookups, and let’s not even get started on the additional charge of those extra cars you’re bringing. When it all totals up to provide you with what most people try to obtain – the highest level of comfort – you’re looking at nearly $100, just for each night you stay at the campgrounds. Adding this in with gas, food, and whatever else you bought to bring along for a more enjoyable stay, you’re looking at a relatively pricey vacation. That’s where boondocking can be a very inexpensive alternative. You may not know it, but just ten miles away from the campground you always stay at is a perfectly flat and reasonable location for you to setup your RV or tents without all of the additional campsite costs and, yes, it’s completely legal! When it comes down to it, even with all the fancy hookups you pay for, service is crummy when you’re camping, and the toilets provided usually aren’t the cleanliest – so why not let nature be your toilet (responsibly, of course) and enjoy your vacation without barely there internet access without the cost of parking your vehicles for a few days and using a stone circle fire pit? Boondocking is becoming a more popular form of camping in today’s world, as many nature enthusiasts join together to share their favorite free and flat spots to camp. When you look at it from this perspective, it seems almost like throwing away money on a traditional camping spot when you could easily make your own, and even better – many areas have already been somewhat set up by other boondockers, and you can help add on to this cost effective method of camping. While boondocking is great for saving some money, there are some things that one should know before trying it – and that is that you won’t have the typical camping community around, which means there’s no camp host to purchase firewood from, and there isn’t a store filled with food fifteen miles away. Instead the responsibilities of being one hundred percent prepared fall on your shoulders. Creating a check list of how much food you’ll need to last you during your trip as well as a sufficient supply of water is incredibly important, as is bringing methods to cook and prepare meals. In addition to this, having first aid kits, and lots of them, available can sometimes be vital, especially when you’re out of range from the rest of the world in one of the most literal senses. Keep a full tank of gas as well, because the last thing you want is to get stranded without any outside help. In addition to these more obvious necessities, consider what else you would want to bring along to create the most enjoyable and comfortable experience possible. If you’re content with a few tents and nothing more than a sleeping bag, then your bedding packing would be relatively light, however if you consider yourself more high maintenance in that department, bringing a few extra blankets would be the smartest option. The seemingly biggest thing about boondocking is to come prepared, and as most situations go, this is common knowledge. 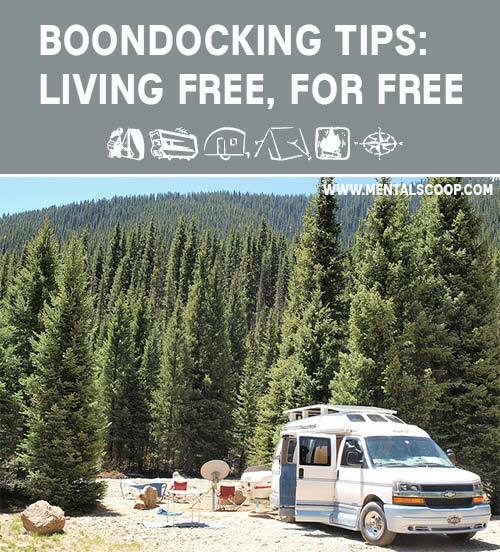 Without the proper amount, you might start rethinking the idea of boondocking altogether. Simply ensure that you have everything you need beforehand, and your experience should be more or less a success.